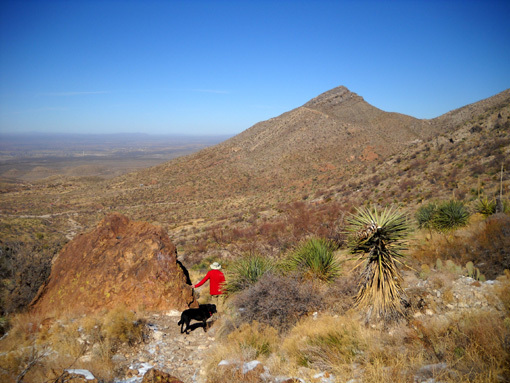 wilderness, scrub vegetation, and open space with 135 miles of multiuse trails . 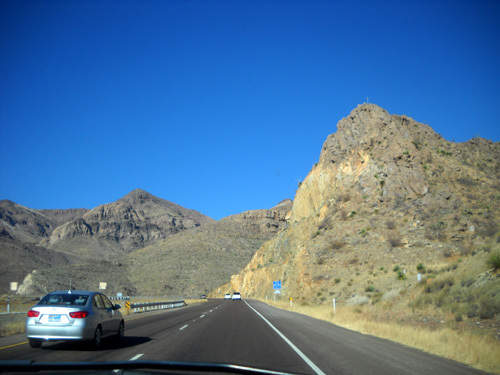 . . "
Yes, that description was one reason we decided to hang out in the El Paso area for the past week! That's a bunch of trails. We had high expectations of exploring quite a few miles on foot and bike. 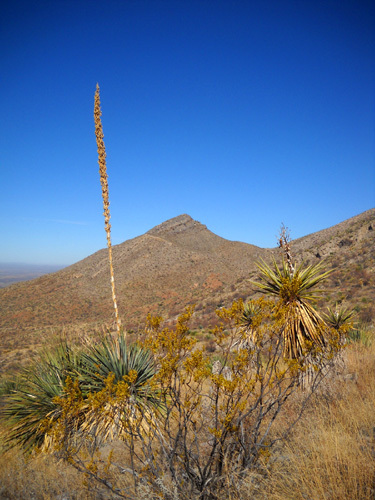 There are several types of cactus plants in the Franklin Mountains, including these yuccas. Unfortunately, there were several reasons we sampled only one of the trails during our stay: the distance we had to drive to reach most of the trails, the rockiness of the trails we found, Jim's fatigue after running ATY at the end of December, and the coziness of our warm camper during yet another colder-than-expected week in the Southwest. 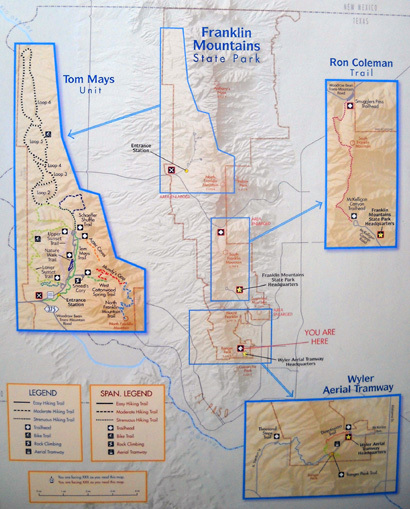 I should also note that the description above, from the state parks guide book, conflicts with some of the information on the agency's own website, which indicates the park contains 37 square miles of rugged terrain and has a trail network that will "ultimately offer a 100-mile system." 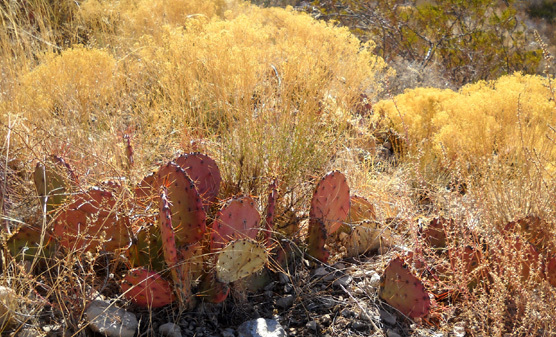 I was determined to add several new Texas state parks to our list of "been-there's." 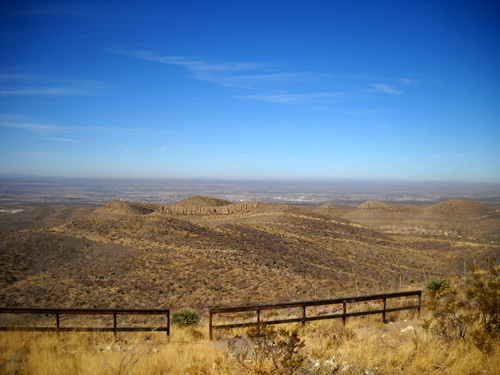 There are three state parks and a state historic site in the El Paso area -- Franklin Mountains State Park, which is surrounded by the city on three sides, Wyler Aerial Tramway, located inside Franklin Mountains but listed as a separate park unit, the Magoffin Home State Historic Site, and Hueco Tanks State Park, 20+ miles to the east of town. 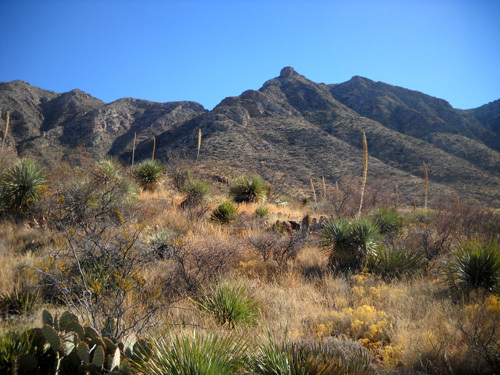 In this entry I'll describe the Franklin Mountains and show you some photos from our hike to Aztec Caves on one of the trails in the northwestern part of the park. 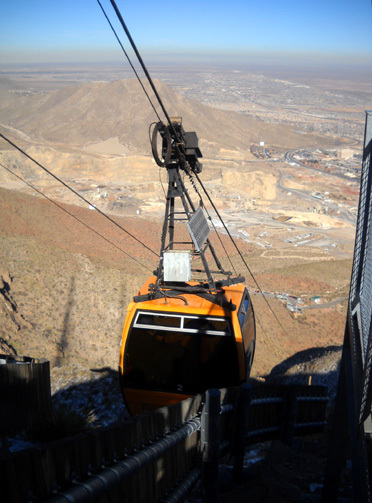 I'll also include our trip to the top of Ranger Peak on a Swiss gondola and the panorama we saw from a mile high in the sky. The first thing we learned about this park is its sheer size -- for an urban park. 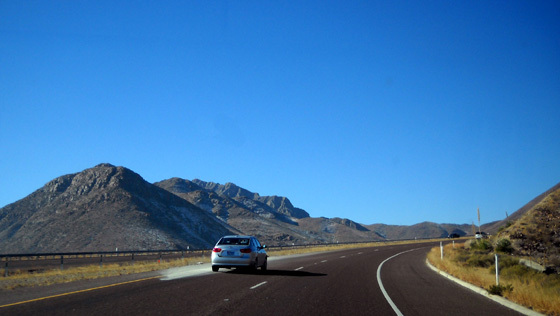 It extends fifteen miles from the heart of the city north to the Texas-New Mexico state line. 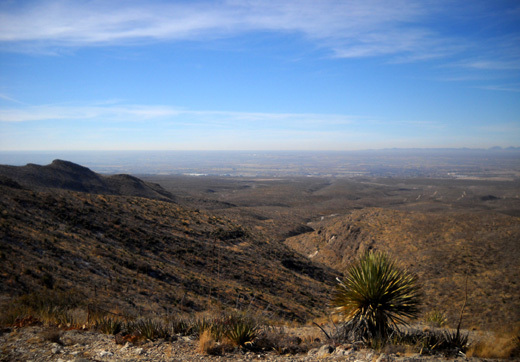 The terrain is rugged and at moderately high altitudes from about 4,000 feet at the base of the mountains to 7,192 feet on the summit of North Franklin Mountain. 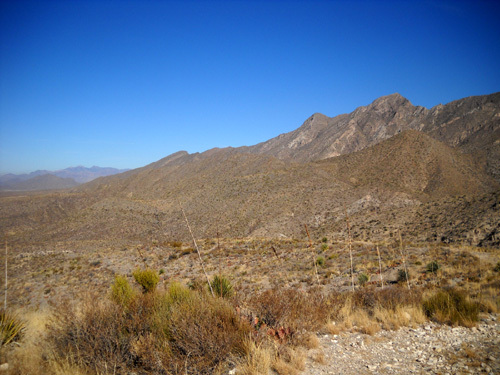 The second thing we learned is that although our campground is close to the southeastern edge of the mountain range, the trailheads for most of the extensive system of hiking and biking trails are in the northwestern part of the Tom Mays Unit of the park and not as close as we'd hoped. The main trailheads are located on the Trans Mountain Highway (Loop 375) that crosses the northern part of the range from east to west. That road gets up to 5,120 feet. 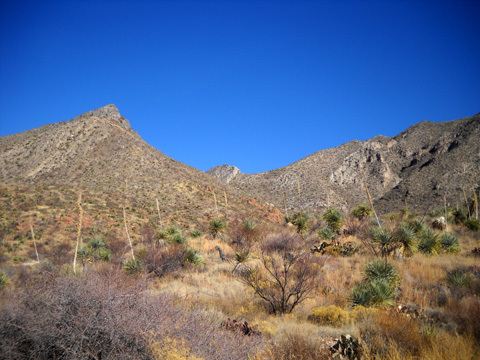 Franklin Mountains is primarily a day-use park for picnics, hikes, runs, mountain bike rides, rock climbing, photography, birding, and other nature study. Since it is usually sunny here year-round, 40+ picnic table have roofs to provide shade. They also have BBQ grills. Most of them are in the northwestern part of the park in the Tom Mays Unit. Note that there is no drinking water or electricity available anywhere in the park for either day or overnight visitors. Be sure to bring plenty of water for yourself and any pets. Even in the winter the sun is pretty harsh in this open terrain. The toilets are self-composting -- no running water there, either. Overnight accommodations are very limited. 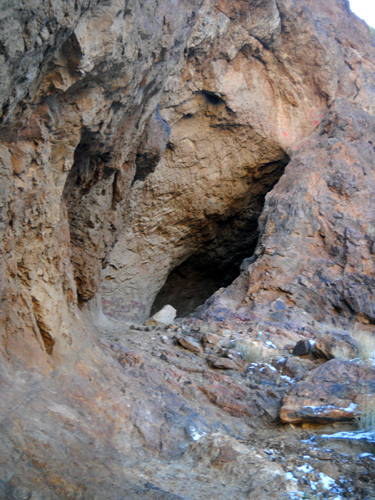 There are no camping facilities in McKelligon Canyon in the southern part of the park and no screened shelters or cabins anywhere. 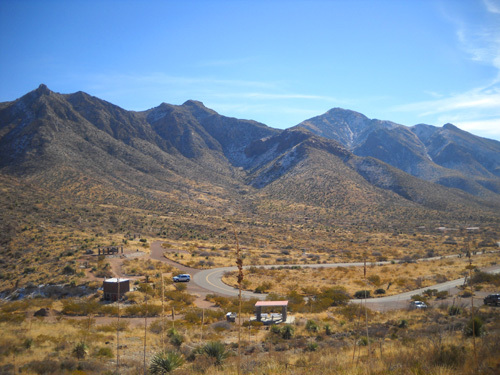 The Tom Mays Unit in the north section has five small RV sites without any electrical hookups or sources of water. 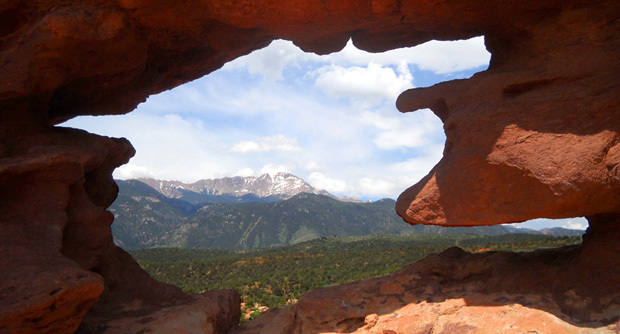 A limited number of primitive tent-camping sites are also available -- again, no water, and no fires are permitted. 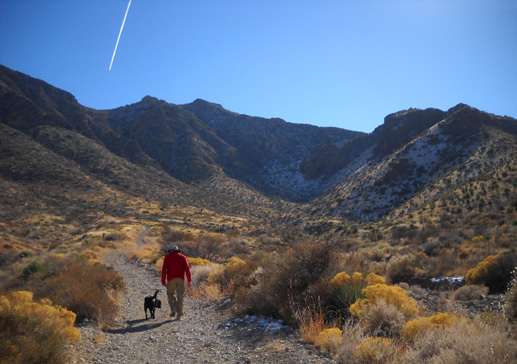 We started our visit to the park one morning last week at the headquarters on McKelligon Canyon Road, which is just a few miles from the Fort Bliss RV Park. Our goal that day was to buy a new annual state park pass (we thought ours expired at the end of December), find a good trail map, and go for a short hike before we planned some longer ones for the remainder of the week. When we asked for maps of all the trails in the park the ranger gave us three maps but they didn't show very many miles of trails at all -- less than thirty, I'd estimate. It was obvious that 1) only one hiking trail goes up from McKelligon Canyon and it's a doozy (the Ron Coleman Trail, which is reportedly steep and rocky) and 2) we'd have to drive about 15 miles to get to all the trailheads on or near the Trans Mountain Hwy. 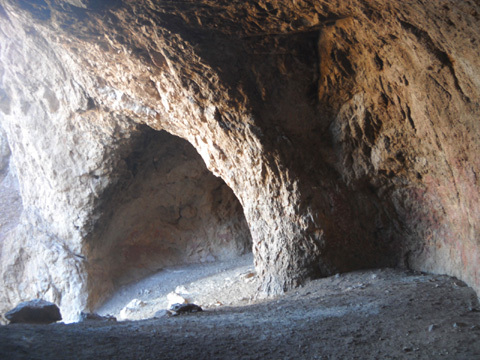 Along the way we passed the entrance to a 1,500-seat amphitheatre surrounded on three sides by canyon walls. It is used for concerts and special events and seems to be the main attraction in this unit of the park. When we drove back out to the park entrance the woman at HQ hadn't returned from lunch yet so we still didn't know if our annual pass was valid or not. 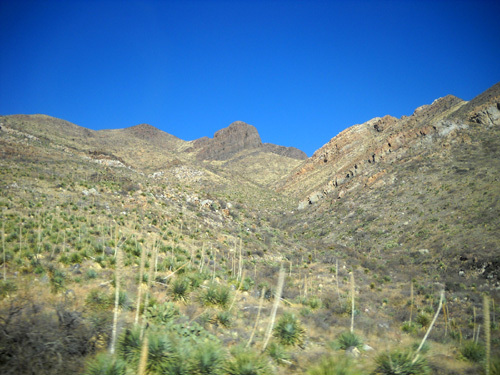 The next day we drove north to the Trans Mountain Highway AKA Loop 375 and turned west toward the trailheads in the Tom Mays Unit of Franklin Mountains SP. We went the parking area at Smuggler's Pass where the Coleman Trail ends and continued down the western side of the Franklin Range to another park entrance with more trailheads. 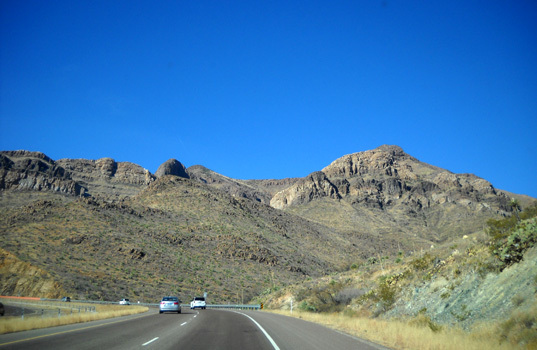 The Trans Mountain Highway is a pleasant, scenic drive and suitable for RVs, although the route we took farther north on NM 404 to reach Fort Bliss when we were pulling the Cameo is easier; it doesn't get up as high as this road. We could see some snow above the 5,000-foot level. The Trans Mountain Highway continues west to I-10 but we didn't have to go that far to reach the entrance to the north unit of the park. 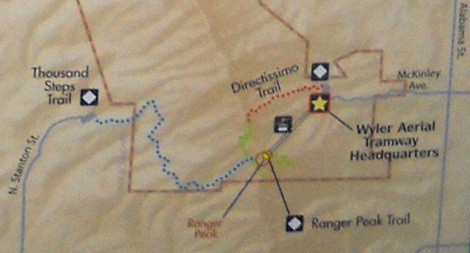 We got a good map of the park road, picnic areas, RV and tent camping areas, and trailheads in this part of the park but the trail map the ranger gave us is very sparse as far as details about the terrain, difficulty, and distance of the various trails. I don't think it included mountain bike trails, either. We weren't sure what we were getting into but decided we'd try one of the trails and turn around if it was too gnarly. The paved park road dead-ends in less than two miles. 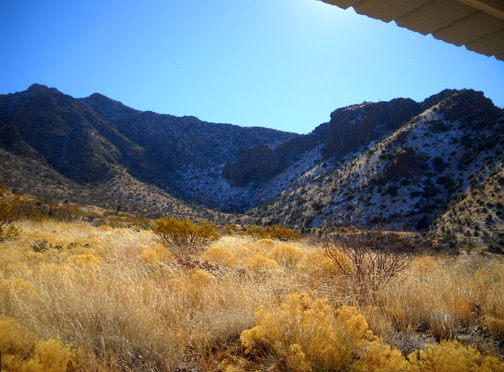 We checked out two short side roads to trailhead parking areas and the RV and primitive camping sites. 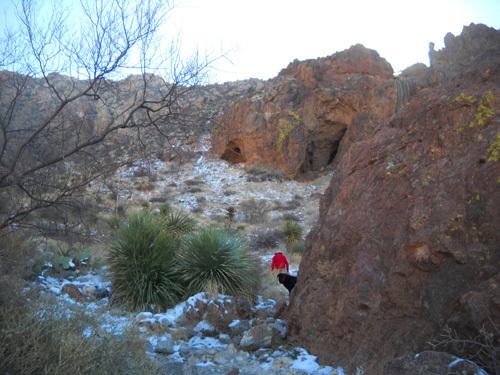 We accessed this trailhead on the spur road that goes through the primitive camping area. 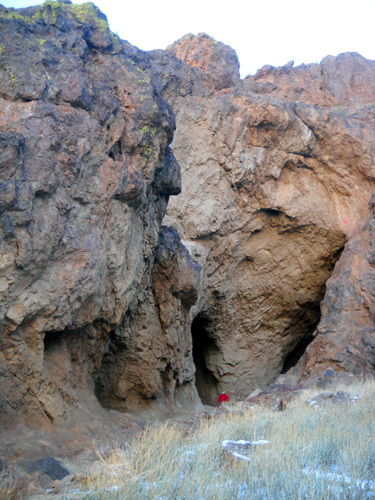 We were heading mostly east, however, making it a challenge to take decent photos as we hiked toward the caves. In the next photo I used the roof of a covered picnic shelter to block the sun's rays. Between the glare of the sun and the shadows it created . . . some of the pictures I'm including here are a little weird. 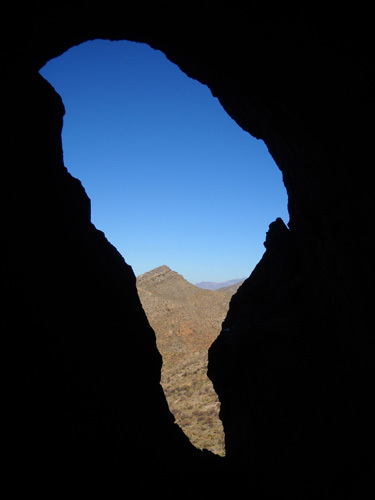 The caves are behind the prism caused by the sun in this photo. 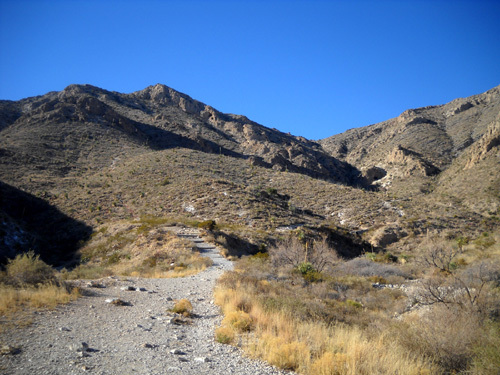 The rocky trail climbs steadily from about 5,000 to 5,400 feet elevation in two-thirds of a mile, becoming steeper and more rugged the last quarter mile as the wider trail narrows down to single track. 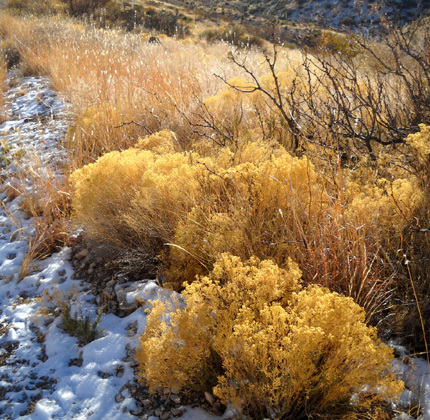 There was still some snow on the ground in the shady canyons and north-facing slopes. 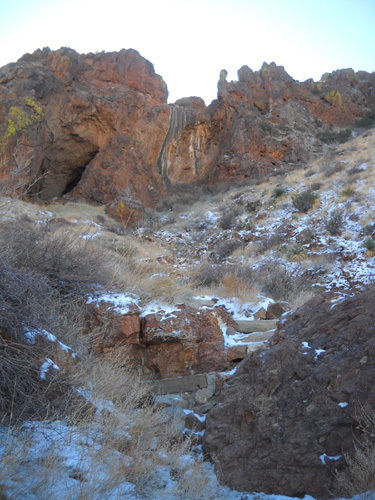 The trail was icy in several places near the caves. 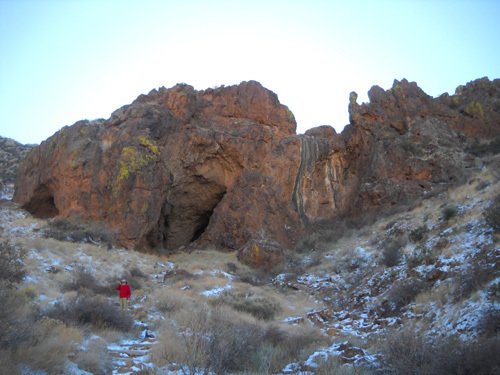 That wasn't much of a problem on the ascent but we had to be very careful descending some fairly steep places near the cave openings. I was wishing I'd brought my trekking poles on the way back down to the truck. 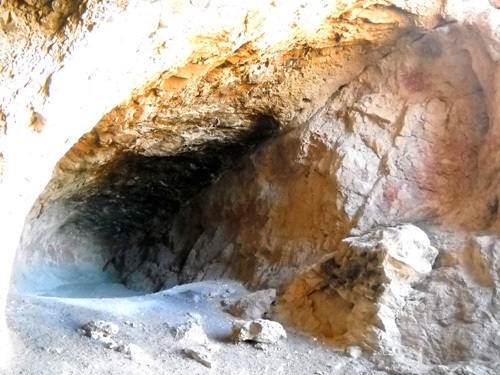 Including the time we spent in the caves, it took us about an hour for this hike. It would have been faster without the gawking and picture-taking. 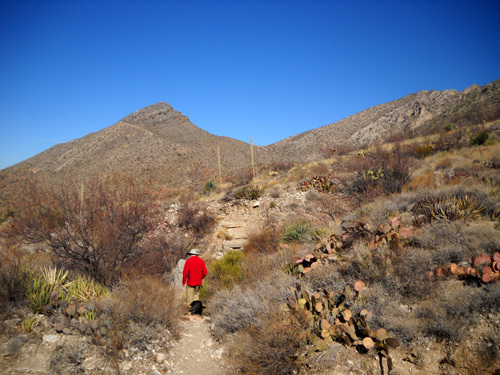 Because it was a weekday morning we saw only one other hiker while we were on this trail. More trails extend into the northern part of the park (photo above) but we didn't go back another day to explore any of them. 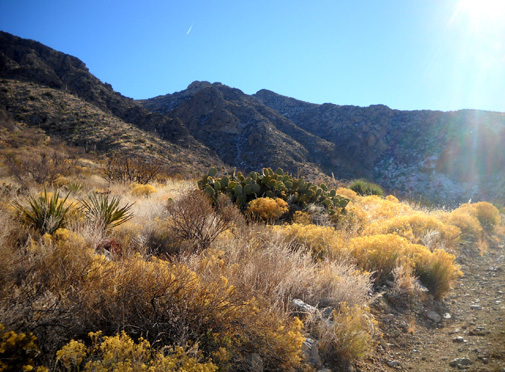 For a map, park video, and more information about activities, trails, fees, hours of operation, geology, history, and wildlife in Franklin Mountains State Park, check out this official web link. Reaching the base of the tramway is a bit of an adventure in itself. 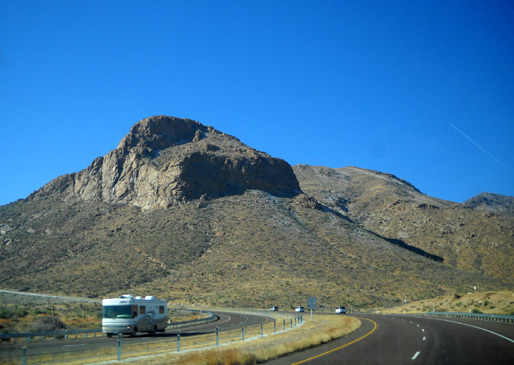 You do not want to take even a medium-sized RV up steep, narrow, winding McKinley Avenue! Even if you could maneuver the street, there isn't room for RVs in the parking lot. 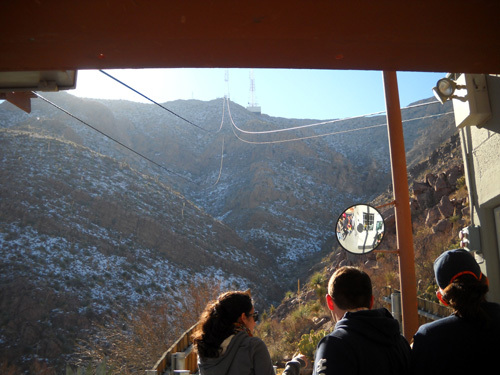 The tramway features two large gondolas that simultaneously carry about ten people each on sturdy steel cables from the base at 4,692 feet to a viewing platform at the summit of Ranger Peak at 5,632 feet. The views to the east on the way up the mountain are great, but the views in all directions are even better at the top as you walk around all four sides of the building that houses a gift shop and snack bar. see to the right. They stretch half a mile down to the lower terminal and parking lot. 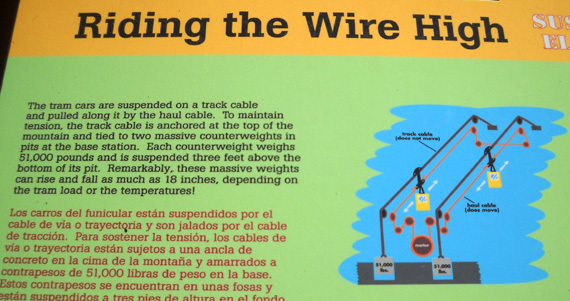 It was interesting to read the interpretive signs and look at the machinery and main control room of the cable system at the base as we waited for our turn on one of the Swiss-made gondolas. The history of the tramway is interesting, too. 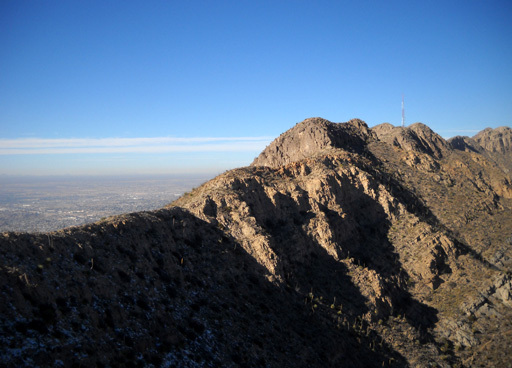 It was the dream of philanthropist Karl O. Wyler, who believed that the spectacular views from the pinnacle of Ranger Peak should be available to the public -- not just the folks who maintain the large radio and TV towers up there. 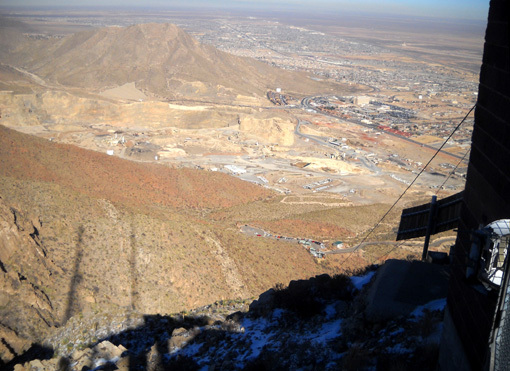 NBC built the original tramway in 1959 when it constructed a transmitter antenna and service platform on the mountain. 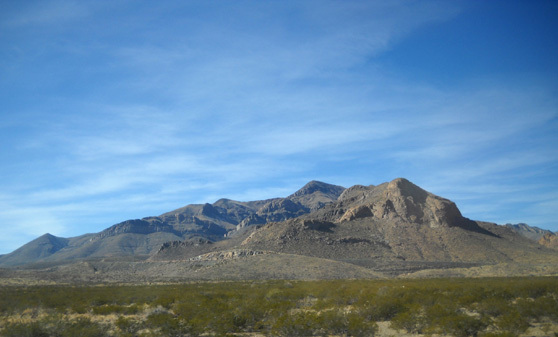 Wyler directed this project and fell in love with the mountain's top-of-the-world views. The tramway was privately owned and operated until 1986, primarily to provide access for maintenance of the telecommunications equipment. The company also allowed public access from 1960 to 1986, when insurance costs for liability sky-rocketed and the public was no longer able to use the tram. 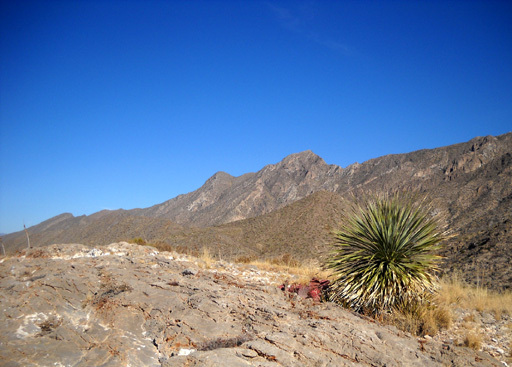 After Wyler's death a significant amount of money from his estate was donated to the state of Texas in 1999 for the express purpose of buying the tramway and fulfilling Wyler's dream of making Ranger Peak accessible to everyone. 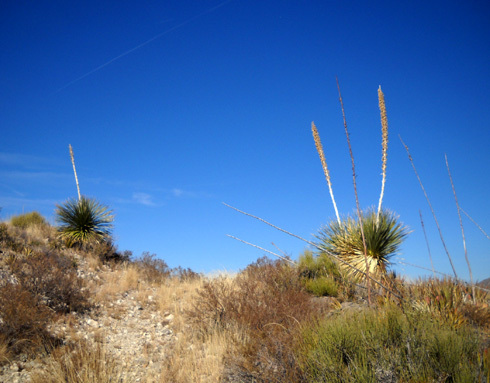 The Texas Parks & Wildlife Department did extensive renovations and opened the park to the public in 2001. The ride to the top on the half-mile long, single-span cable system (i.e., no support towers) is smooth and takes about four minutes. 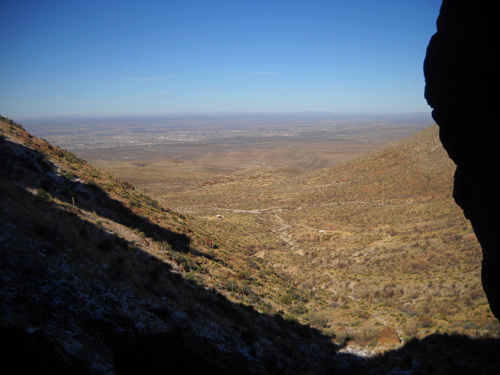 Visitors are lifted about 940 vertical feet as they glide above the rugged terrain below. A "cabin attendant" is on-board to provide narration and answer questions. We went up on a sunny but windy morning with temperatures still in the 40s F. so we didn't spend a lot of time on top -- just long enough to walk around the observation deck, take a few pictures, and catch the second cable car back down. According to the website and a brochure we got, on a clear day you can see out over two countries and three states encompassing 7,000 square miles. The two countries and two of the states are obvious. What is the third state?? One of the gondolas approaches the upper terminal platform. The ride back down to the lower terminal was fun. When you're going up in the gondola it appears that the gondola coming down toward you is going faster. It seems that way when you're going down, too -- but both cable cars always travel at the same speed, counter-balancing each other's weight. We ran into a bit of a problem with our Texas state park pass here, too. Again, we were assuming we'd have to buy a new one to save on entrance fees to the parks we wanted to visit this week. 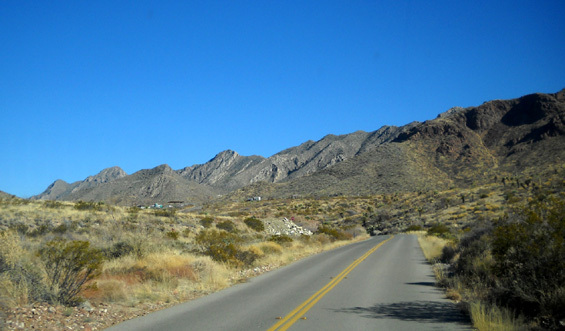 However, the woman collecting fees for the tramway was also having problems with her computer, just like the ranger at the Franklin Mountains park headquarters. It was the first weekday after the New Year's holiday weekend so perhaps the TPWD system hadn't been reset for 2011?? This woman wasn't able to determine if our pass was still valid either, and we didn't want to shell out $60 for a new one if it wasn't necessary yet. After several minutes a line was forming behind us to pay for tram tickets so we told her to stop trying. It really didn't matter at this park anyway. 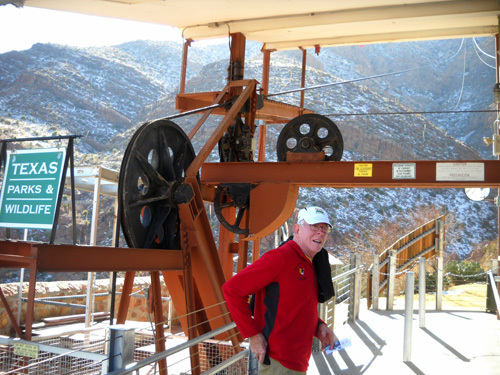 Whether we had a parks pass or not, we each still had to pay a $7 fee to ride the tramway to the top of Ranger Peak. The fee for kids age 12 and under is $4. 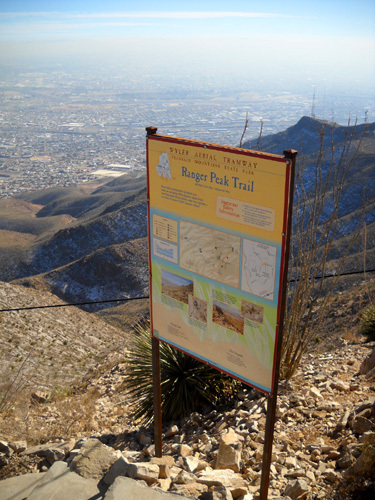 It was fun to ride up to the top but in retrospect we would have had more fun hiking up Ranger Peak Trail from the base to the top and back down -- and we could have done that for free. We didn't realize that was an option until we saw the trail as we rode up the cable car. If we're ever in this area again I'd like to hike that trail. For more information about days and hours of operation, etc., click on this link for the official TPWD tramway website.